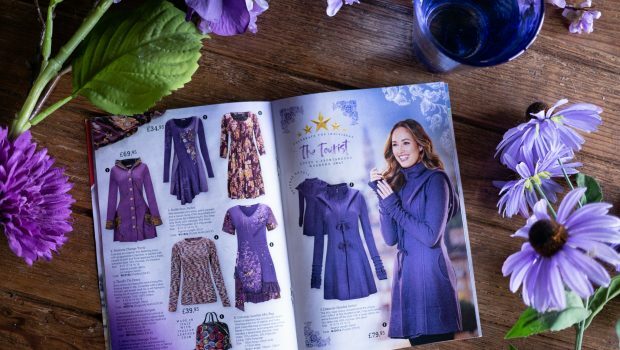 I always love it when a catalogue of the new season’s clothing from Joe Browns lands on my doormat. (Metaphorical doormat. We actually have a damp patch of concrete below the letterbox.) And this particular time, there was one item that made me get online to make an order. 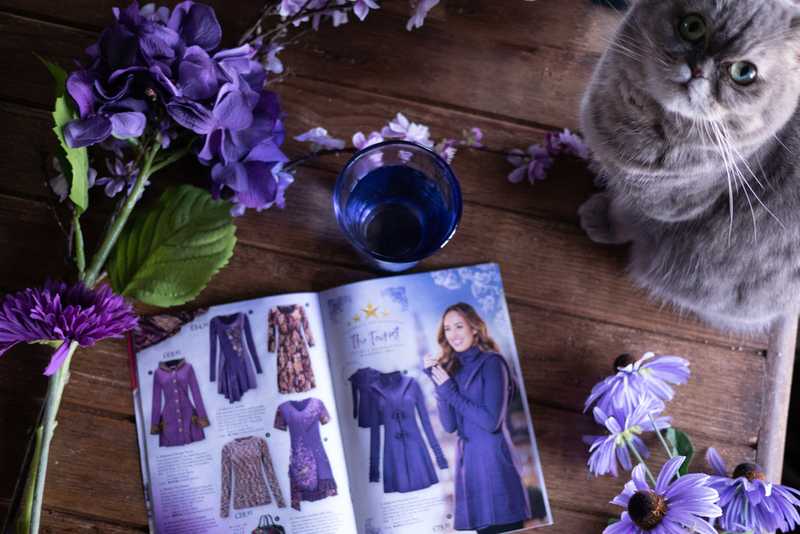 And it was a purple coat…. Chris bought me a beautiful long red coat a few years ago for Christmas, and I still absolutely love it. However, blog readers and YouTube viewers are probably a bit bored of it by now! And I was thinking that I’d like a shorter option as the red coat doesn’t always go perfectly with my outfit. The purple one caught my eye because it looked like it was made from similar fabric, and the design was just very cool. So anyway, after far too long browsing the Joe Browns website, I picked five items including the coat. Delivery was five days – it would have been four if the My Hermes driver had bothered to turn round. (She admitted she went sailing past our house the previous day.) Anyway, the coat was just a cool as it promised to be. My gripes are with the hood – which is pointless – just a piece of floppy fabric and not really useable as a hood at all. And the fact that it’s quite itchy. I’m hoping it softens over time. Otherwise, I love it and know I will wear it a lot. 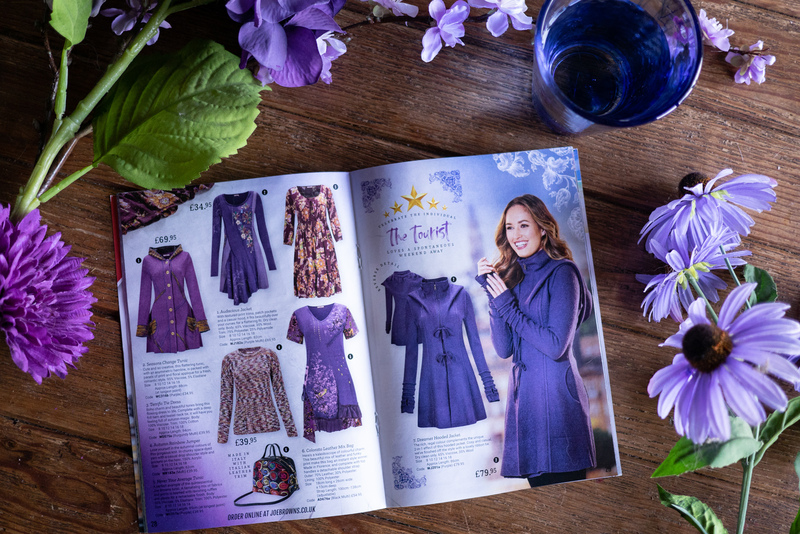 It’s a good deep shade of purple; zips up with two ties which are really flattering; has cool thumb holes and I like the ruching detail on the bottom of the sleeves. I also bought a 1950’s style summer dress for less than half price – I couldn’t leave that behind could I? However, the mustard colour of the flowers and the thistles actually give it a bit of an autumnal feel, so if the weather stays as beautiful as it is today, I’ll definitely be able to wear it paired with some brown boots. I also have a mustard jumper that looks good over the top. It is pretty much completely the wrong time of year for the next Joe Browns item of clothing I bought! It’s a very pretty lace top with short sleeves and buttons up the front. However, we do have a winter sun holiday booked, and I’m looking forward to wearing this then. I think it will work well over a swimming costume by the pool, or over a vest and lightweight trousers. Next we have a gorgeous fit and flare dress that I am totally in love with. 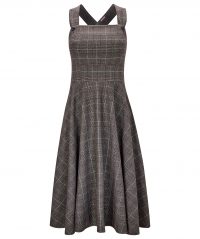 It’s grey Prince of Wales type grey check print and is a pinafore style. I find Joe Browns clothes are often made with a high waist, so I was glad that I could adjust it slightly with buttons on the straps to lower it. 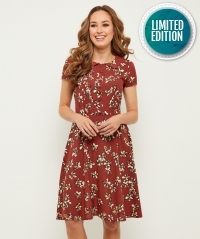 It is simply the perfect dress and I’m hoping it’s one of the designs Joe Browns chooses to replicate over again with different colours. I will definitely buy them all! It makes great quirky smart office wear, but is also comfortable enough to wear around the house. I will definitely pick this dress for working from home days. Fortunately for me, that’s every day! And lastly, I chose another coat! Yes, you wait for ages and then two come along at once. I so nearly didn’t put this in my basket, because as you can imagine, two coats definitely hike up the cost of the order, but I just couldn’t resist it. I’m so glad I didn’t because I actually prefer it to the purple coat. I thought about choosing between them, but in the end I couldn’t; I love them both. This one, with the way it flares out from the waist, makes it absolutely perfect to wear with my 1950’s style skirts and dresses. I know I’ll never find another coat as nice as this one, so it’s not likely to be my walking the dog coat, but I can’t wait to wear it out and about and show it off! PS. Even my cat told me to buy it! I still have the notebook in which I brain-stormed possible names for my clothing business sixteen years ago! 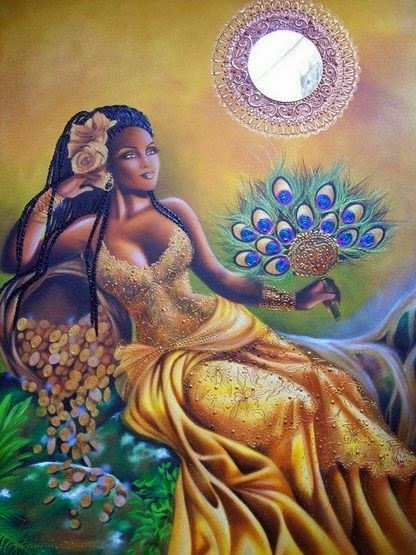 I was particularly interested in goddesses at that time and wrote several down, but the name Oshun resonated. When I found out more about her, she seemed perfect to name my brand after. She is a water goddess of love; a deity of the Yoruba people of West Africa and is associated with femininity, sensuality and the power of women. She has come into the news lately because there are rumours that Beyonce wore a dress in Lemonade which specifically represented her…. 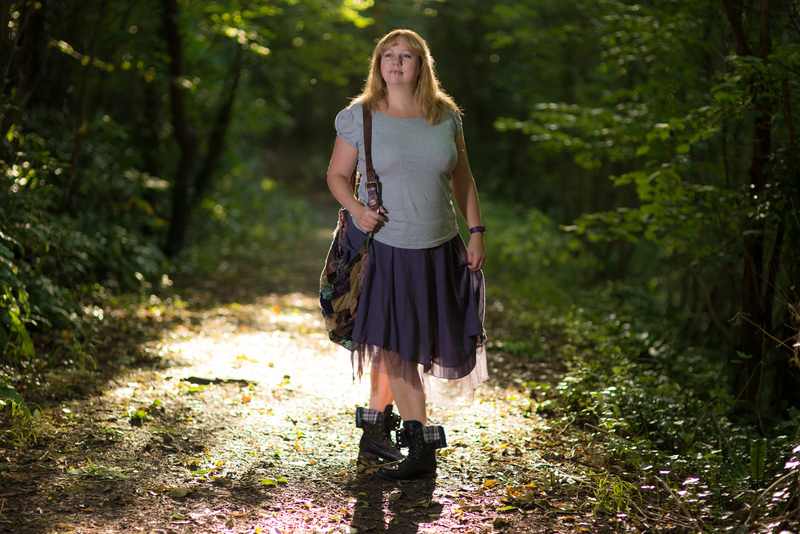 You don’t need me to tell you how to style a grey t-shirt – it goes with everything: jeans or any style trousers; any length, colour or design of skirt; or under dungarees or pinafore dresses. However, I do want to suggest that’s it’s a much more flexible than the plain white t-shirt. White doesn’t really suit me anyway – I have fair skin with a cool tone, so white tends to wash me out, whereas grey basically somehow makes me look a bit better! Here’s a couple of outfits with the same t-shirt. They were taken a couple of months apart from each other, and when I picked out the purple skirt, I had totally forgotten the previous outfit also had purple bottoms. 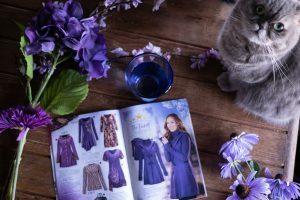 Never mind, second to dusky blush pink, purple is my next favourite colour to wear with grey…..
I’m slightly worried because I had another of those, ‘Yes I’ll just buy it without trying it on’ moments the other day in Tesco. I loved the mustard yellow colour (something that’s creeping into my wardrobe more and more lately) and the ditsy blue and red floral print over it was so pretty. The ruffles confirmed the purchase in my mind. Because, you know, I just love ruffles…. A few weeks ago now, Chris and I had our first weekend away of the year in our VW Camper van. I packed lots of jumpers and warm clothes because spring really hadn’t kicked in yet. 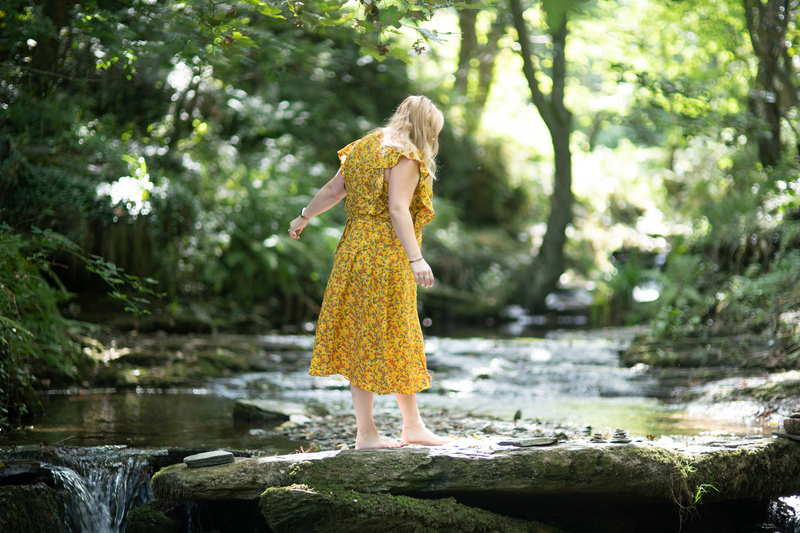 However, once we’d gone through Bodmin Moor in Cornwall, the sun shone, and I felt I needed a new summer dress. 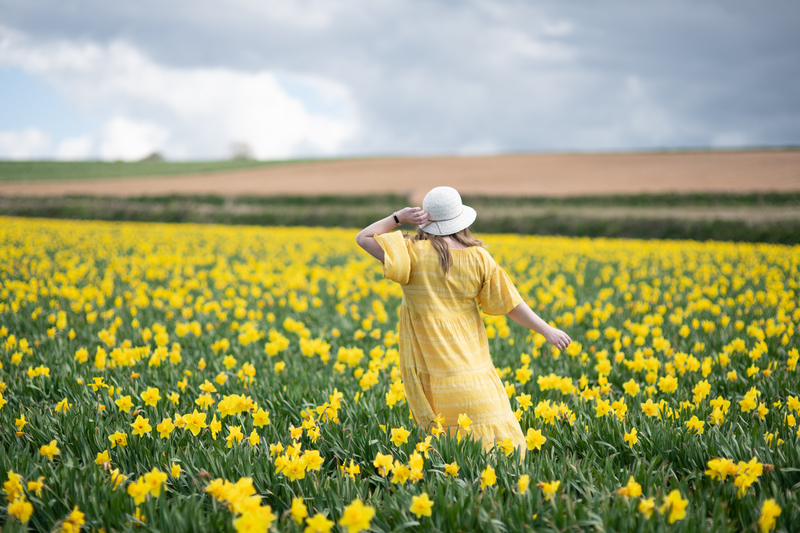 I popped in Marks and Spencer in Truro and spotted this gorgeous yellow dress….